On the sunny side of the tourist village Belvedere, hidden between palms, pines and other Mediterranean vegetation, lie in total 173 wonderful high class apartments with their own parking place, big terraces and grill place in the garden, capacity from 3 till 6 persons. 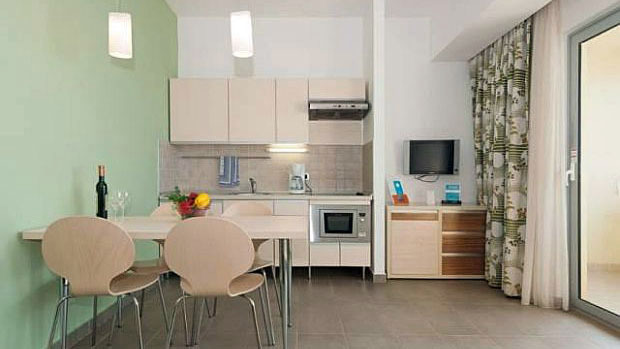 All the apartments are modern designed following the EU standards and equipped with SAT-TV-LCD, phone, safe, air conditioning, coffee machine, hair dryer, microwave, Internet (extra chargeable). There is also an outdoor swimming pool, children's pool (both with sweet water) and sun beds with umbrellas (limited number is free of charge). Further, in the tourist village Belvedere there are a supermarket, minimarket, sport center, water sports, wellness center with fitness studio, tennis courts, beach volley and minigolf, discotheque, restaurants, pastry shops, animation center, bistro, bar, children's playgrounds, souvenir shops, hairdresser and beauty salon. The well maintained pebble, rocky and paved beach is approximately 150 meters distant. 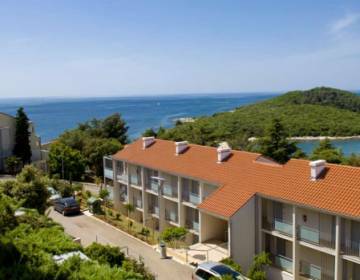 The Apartments BELVEDERE (Vrsar) **** are an ideal accommodation for demanding guests, who wish to get the best value for their money (high quality service at a reasonable price). 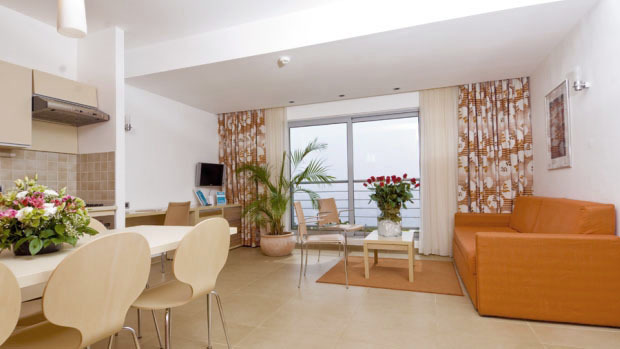 Living room with 1 sofa, SAT-TV-LCD and telephone, completely equipped kitchen with refrigerator, microwave and coffee machine, one separate bedroom with 2 beds, bathroom / WC with showercab and hair dryer, passage and big terrace, situated on the park or sea side. The apartment is integrally air conditioned. The size of the apartment is approximately 40 m2 (terrace included). Living room with 1 double sofa, SAT-TV-LCD and telephone, completely equipped kitchen with refrigerator, microwave and coffee machine, one separate bedroom with 2 beds, bathroom / WC with showercab and hair dryer, passage and big terrace, situated on the park or sea side. The apartment is integrally air conditioned. The size of the apartment is approximately 50 m2 (terrace included). Living room with 1 sofa, SAT-TV-LCD and telephone, completely equipped kitchen with refrigerator, microwave and coffee machine, two separate bedrooms with 2 beds each, two separate bathrooms / WC with showercab and hair dryer, passage and big terrace, situated on the park or sea side. The apartment is integrally air conditioned. 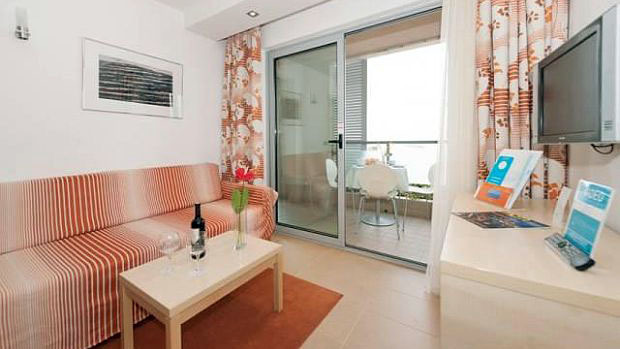 The size of the apartment is approximately 60 m2 (terrace included). Living room with 1 double sofa, SAT-TV-LCD and telephone, completely equipped kitchen with refrigerator, microwave and coffee machine, two separate bedrooms with 2 beds each, two separate bathrooms / WC with showercab and hair dryer, passage and big terrace, situated on the park or sea side. The apartment is integrally air conditioned. The size of the apartment is approximately 70 m2 (terrace included). 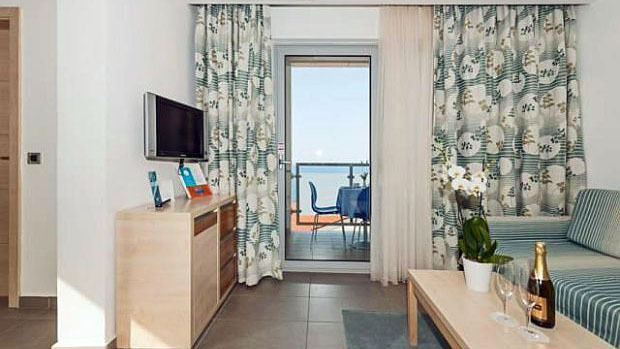 Service: Water, Electricity, Bed Linen (twice per Week), Towels (four times per Week) and Final Cleaning included.